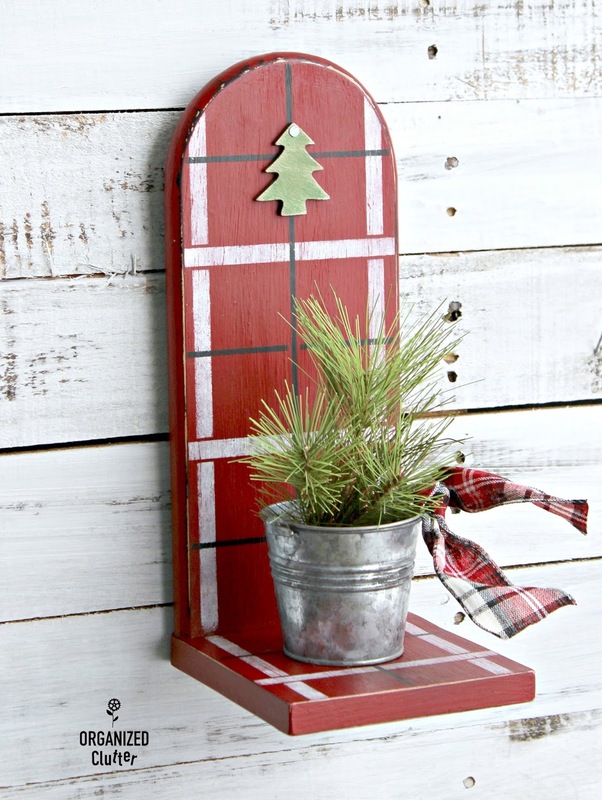 One of my recent purchases posted to Fun Fall Junk Finds was this paper towel holder. It was made to sit on the counter and not hang on the wall. This is the back with prim style flowers. First I base coated the paper towel holder with Rust-Oleum Painters Touch Latex in Flat Black . Just one coat. I was inspired by this Holiday Time Ribbon from a Walmart Canada store. It's red, black and white plaid. I painted over the black flat paint with 2-3 coats (in some spots three) of Deco Art Americana Decor Chalky Finish Paint in Rouge . 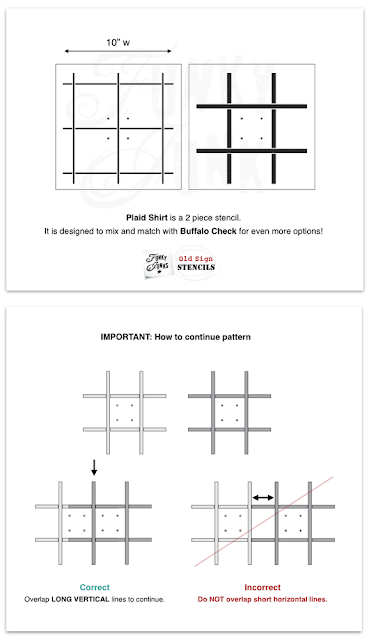 Next, I pulled out one of my favorite stencils, Plaid Shirt, from *Old Sign Stencils. 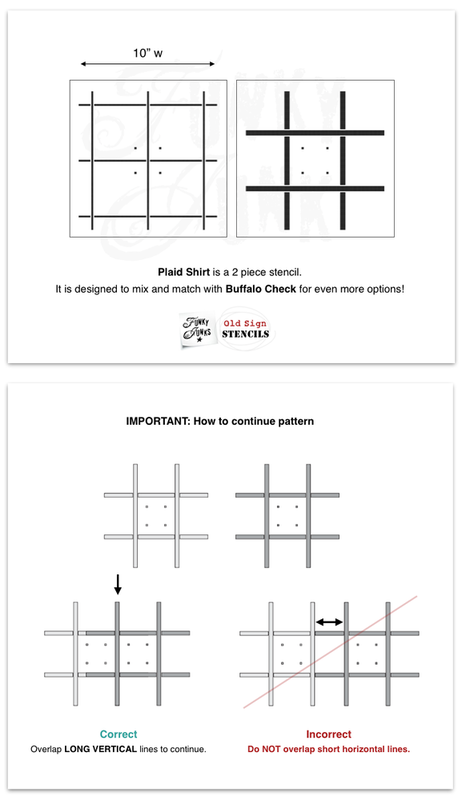 It's a two piece stencil. First I stenciled the fatter lines with Ceramcoat Acrylic Paint in White . I taped it down at the top with blue painter's tape. It was fairly tricky to move the stencil to the inside edges. I had to bend the stencil, after lining up the fat lines, and hold it down with any available fingers to get into the inside corner. As you can see, I removed the paper towel holder dowel. After stenciling the thin lines with Ceramcoat Acrylic Paint in Black , I was ready to distress my project with 150 grit sandpaper. Then I sealed the chalky paint and stenciling with Varathane Crystal Clear Water-Based Polyurethane, Satin Finish . After my painting, stenciling and sealing with water based poly were done, I drilled a hole in the bottom of this little metal pail. You can find these little galvanized look pails at any craft shop. Mine has had hen and chicks planted in it so it's a little weathered. I then put the screw, that originally held the dowel, back up through the hole in the bottom of the paper towel holder, and added a wing nut to hold the little bucket in place. I added a small wooden tree cutout, also from Walmart Canada with a short nail with a larger head. I think a carpet nail. 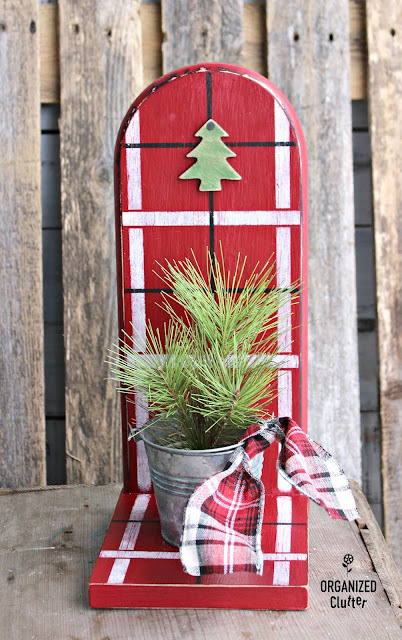 I also tied a piece of my plaid inspiration ribbon onto the pail handle, and added some faux long needle greenery. 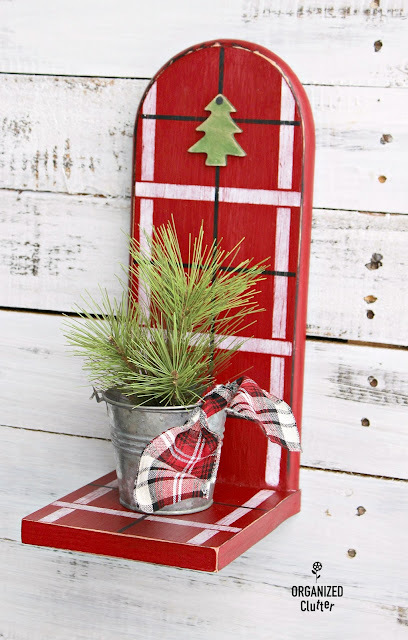 My paper towel holder/Christmas decor piece can stand on a table, counter or shelf. Or it can hang on the wall with a sawtooth hanger. Another thrift shop purchase transformed to inexpensive decor! I love your idea for this paper towel holder! Festive and fun! OMG... so cute! Your imagination is awesome, I never would have "seen" that in an old paper towel holder! I love seeing all your transformations - this one is super! Really clever Carlene. Love how you used the stencils. That's so darn cute, Carlene! I'd love to hang that on my wall, for sure! I can barely stand how adorable this is, Carlene! Another way to extend hard to reach lines or over curved edges is to manually tape them off with painter's tape. I was wondering how you accomplished this! Your colour choices are amazing. This is really adorable. 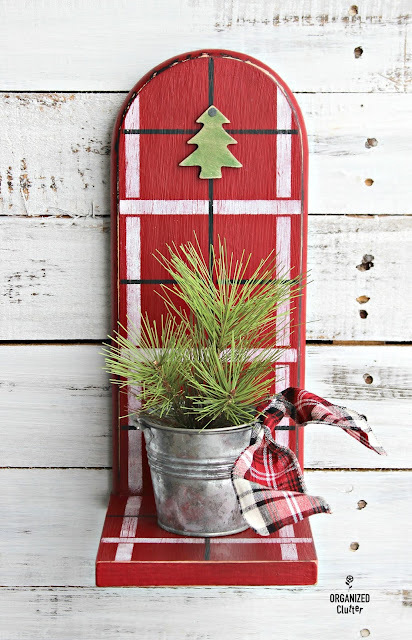 I am sharing I love that plaid stencil but also your re-purposing idea. That turned our super cute! I love plaid, and your color choice fits this repurpose perfect! I will be looking at paper towel holders in a whole new way. Awww how adorable! Love that plaid! Beautiful makeover!